Acrylic Vs Glass Aquariums | The Definitive Guide To Help You Choose. Which type of fish tank ? - Acrylic Vs Glass Aquariums - And which is the best option! Each option has something unique to offer, and you will have to pick a choice that is best suited to your needs and desires to avoid regretting your purchase. The truth is that no single option is ultimately better than the other. Both glass and acrylic have upsides and downsides, and you have to choose the option that best serves your needs. Therefore, you should strive to understand these options better to make a better purchase decision. Some factors to consider include price, durability, maintenance, aesthetics, and so forth. This guide will help you make the most suitable fish tank choice given your individual needs as far as having a beautiful habitat for your underwater pet. Traditionally glass is used for fish tank manufacture, much longer than acrylic has. That explains why glass fish tanks have been the industry standard since they are more common in the past. However, acrylic is steadily catching up, and it is proving to be quite popular in this industry, especially for bigger fish tanks. In general, glass is the cheaper option. Surprisingly, many people are not aware of this fact. So, if you want a fish tank that is reasonably priced, you should pick glass over acrylic. However, the reason acrylic tanks cost more is that the material is much more expensive to ship in comparison to glass, given its higher susceptibility to scratching. So, although it might cost less to make an acrylic tank, the transportation process is a lot more demanding since this material can easily get scratched and become unusable. Glass fish tanks are easier to make than acrylic fish tanks. It is because acrylic requires the use of sophisticated tools and other manufacturing techniques during the construction process. One of the main reasons glass fish tanks end up being much cheaper than their acrylic counterparts, is their more natural construction methods. Glass fish tanks may be easier to construct in comparison to acrylic fish tanks, but acrylic fish tanks offer more shaping options. With glass, you are pretty much stuck with rectangular - shaped fish tanks. While other options are possible, they are difficult and demanding to put together since glass is quite brittle and rigid. Acrylic, however, offers more flexibility, and that means it can form curved surfaces that can even make the small fish swimming around the aquarium look bigger for more exciting effects. Acrylic is made into bubbles, cylinders, spheres, and other kinds of fish aquarium designs. Both glass and acrylic fish tanks can leak. And all of them can crack and drain their contents very fast. However, leakages are more manageable on glass fish tanks, as they start slowly and progress much more slowly. The way in which the tanks are built, to begin with, whether it's from glass or acrylic, has a significant role in how leakage problems arise. For instance, acrylic fish tanks are put together using molecular bonding, while glass fish tanks are constructed using sealants. Acrylic fish tank walls bond together to form a single piece after the resin used to put them together melts. It makes them, in general, less susceptible to leakages that glass tanks often experience. If you want to add more accessories to your fish tank in the future, then you are better off starting with an acrylic fish tank. Glass fish tanks are not easily modified. For instance, when adding a water filtration system. Acrylic is also easier to modify after the tank has been made to attach pipes to the tank. Glass is more delicate, and such modification work will need to be complete before the tank is made. Even drilling overflow holes can be a challenge with glass fish tanks. Acrylic fish tanks are better suited to such modifications. Glass is very dense, and it has a refractive index higher than that of water. For this reason, when used to make aquariums in different shapes and sizes, the fish and the contents of the fish tank will get distorted. However acrylic does not come with such challenges. Even when made to assume a curved form, acrylic does not result in distortion, as its refractive index is closer to that of water. Still, glass does not seriously distort the appearance of the tank contents to the point of making distortion a serious concern, especially when it comes to conventional rectangular fish tanks. Acrylic fish tanks have a distinct advantage in the way their corners fit together. The material used to glue them together is transparent, and this ensures that your view is not interrupted in any way. On the other hand, glass fish tanks are joined together using a silicone sealant, which is sometimes black or translucent in color. But even the clear sealant ends up turning dark as it absorbs the compounds that are used to treat the water - which can offer an interrupted view of the fish in the tank. Cleaning acrylic fish tanks are much easier than cleaning glass fish tanks, especially when the inside needs cleaning as well. With the right chemicals, you can clean an acrylic fish tank with ease without even removing the fish and other contents of the fish tank. The fact that the bonding holding the acrylic pieces together are much stronger makes this process much more manageable. The bonding used on the glass is more delicate, and messing around with it can significantly reduce the aesthetic appeal of the glass fish tank. Glass is much more substantial than acrylic due to its higher density. Glass can be up to 10 times as heavy as acrylic. It makes transportation of glass tanks a little more challenging. So, if portability is an issue, an acrylic fish tank might be a better option for you. When it comes to resisting scratches, glass is better than acrylic. If a sharp object comes into contact with the glass surface, the effect will typically not become apparent. It is not usually the case with acrylic, which has a high affinity of displaying scratch marks under similar circumstances. It is without a doubt acrylic's most significant downside when compared to glass. It is not just external impact and contact that can result in scratches on acrylic fish tanks. The fish themselves can also damage the tank from the inside and ruin its aesthetic appeal. However, acrylic tanks can be polished to get rid of the scratches. While glass fish tanks are quite good at resisting scratches, they can still get scratched. But unlike acrylic, scratches on glass cannot be easily fixed. Acrylic tanks are quite strong, and they can hold quite a large amount of water. Generally, acrylic can be up to 17 times as strong as glass. However, glass fish tanks are pretty good as well; they need to be thick enough to support the water in them. So, this should generally not be a big concern when choosing between acrylic and a glass fish tank. What matters the most is the quality of the craft that was used to put the tank together, and the variety of the construction materials used. Acrylic offers better heat insulation than glass. It can be a concern where the fish tank is in places where heat might be required to warm the tank due to low temperatures. In general, heat insulation is about 20% better with acrylic fish tanks. Glass and acrylic have different rigidity levels. Glass is very rigid, but acrylic is not. For this reason, while glass fish tanks will often not need much support, acrylic tanks usually require a lot of support at the top to keep them from bulging, flexing or splitting along the seam lines. For the same reason, acrylic tanks come with some form of bracing to handle the weight of the water contained in them without falling apart or getting deformed. The bottom also needs support when making acrylic fish tanks as the weight of the water can make the base unstable. Glass fish tanks do not require such extra attention as they can support themselves quite well. When both acrylic and glass are new, they are very clear material. Acrylic is usually much clearer in comparison to Glass with a transparency grading of 95%. However, over time, while glass will maintain its transparent state, acrylic will often discolor and watching your pets swim around will not be as rewarding as it once was. Even without scratches ruining their clarity, acrylic tanks tend to assume a yellowish tinge over the passage of time. Porosity, or the ability to allow substances to pass through, is another factor that separates glass and acrylic fish tanks. Glass is not porous, but acrylic is, and it tends to absorb the chemicals in the water, which can alter its appearance and affect its clarity. Substances can pass from one side of the acrylic fish tank to the other; although this should not be a big concern when this material is used to make fish tanks. When some UV protection is necessary, then the glass is the better option as it can resist these harmful rays. Unfortunately, no acrylic material is UV proof. Therefore, the effects of these powerful rays will eventually take a toll on acrylic fish tanks, making them weaker and shortening their lifespan. However, glass does not face similar challenges. Therefore in places where exposure to UV lighting is present - then it is best to work with a glass fish tank for lasting user experience. Glass is much more fragile than acrylic. This is where most people decide to choose acrylic over glass, especially if the fish tank is to be placed in an area where it might end up taking some form of impact or another. Even when acrylic tanks are drop tested, they easily handle the impact, unlike glass tanks which will often shatter into pieces. So, in scenarios where impacts might be common, for instance, in places where kids might be playing around, acrylic tanks might be the better option. Glass Aquariums can shatter and crumble once they break, spilling their contents and even pose some injury hazards in form of sharp glass shards. Whatever choice you come down to when choosing between acrylic and a glass fish tank, you should always get the tank from the right supplier. 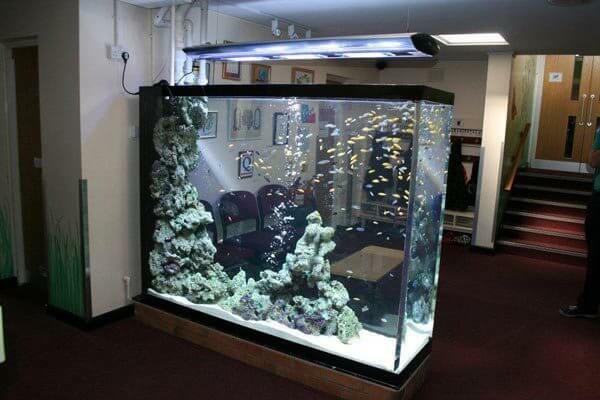 It will ensure you get the best quality standards, regardless of whether you decide to go with acrylic or a glass fish tank. On our site, you will find a great selection of fish tanks, featuring unique designs and offered at incredibly affordable prices.